What is the PSO's Role in Helping Hospitals Reduce Unnecessary Readmissions? 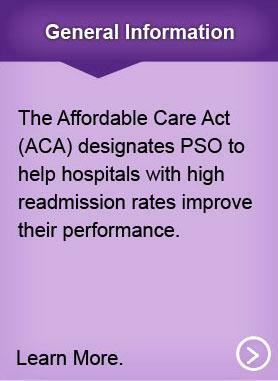 The Affordable Care Act (ACA) designates that PSOs help hospitals with high readmission rates improve their performance. The ACA also calls for the Department of Health and Human Services (HHS) to provide a program to support PSOs in this work. As part of this program, the information presented here is designed for PSOs that wish to assist hospitals in reducing unnecessary readmissions. 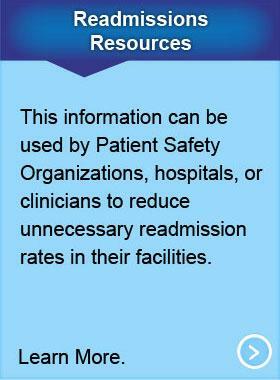 Learn more about Reducing Hospital Readmissions. What Hospitals are “Eligible” to Work With a PSO on Readmissions? Section 399KK of the ACA defines an ‘eligible hospital’ as "hospital that the Secretary determines has a high rate of risk-adjusted readmissions for the conditions described in section 1886(q)(8)(A) of the Social Security Act and has not taken appropriate steps to reduce such readmissions and improve patient safety, as evidenced through historically high rates of readmissions as determined by the Secretary." The Centers for Medicare & Medicaid Services (CMS) determine hospital readmissions rates. However, all hospitals, and not only those considered ‘eligible’, may work with a PSO on readmissions if they so choose. Hospitals need only determine which available PSO, offers a program on reducing readmissions that is the most helpful to them. Section 3025 of the Affordable Care Act added section 1886(q) to the Social Security Act, establishing the Hospital Readmissions Reduction Program, which requires the CMS to reduce payments to hospitals with excess readmissions, effective for discharges beginning on October 1, 2012. The regulations that implement this provision are in subpart I of 42 CFR part 412 (§412.150 through §412.154). Please visit the Hospital Readmissions Reduction Program for more information. Learn about the resources and tools that can be used to improve the readmission process. Partnership for Patients, a national public–private initiative, has set a goal of reducing unnecessary hospital readmissions by 20%. The Community-based Care Transitions Program, authorized under Section 3026 of the ACA, is part of this effort. The ACA also allows individual hospitals to work with PSOs on reducing high readmission rates by improving the transition process for a patient being discharged from hospital to home. In addition, Quality Improvement Organizations (QIOs), regional organizations that work under contract to CMS to improve care for Medicare beneficiaries, are helping selected communities in their regions to collaborate on efforts to reduce unnecessary hospital readmissions. When patients ask questions about a medical condition, diagnosis, or hospital visit, they can prepare to take care of themselves at home and reduce the likelihood of a return trip to the hospital. AHRQ and the Ad Council have developed “Questions Are the Answer,” a multimedia campaign on the importance of asking these questions. For patient stories, resources and tools, please visit Questions to Ask Your Doctor. For health education materials to help patients get better care, please visit Patients and Consumers. For questions about PSO-related ACA provisions, or how your PSO can help a hospital improve a high readmission rate, contact the PSO Program at PSO@ahrq.hhs.gov. Before selecting a tool to implement, a hospital may wish to study its readmission history and evaluate the potential causes and appropriateness of recent readmissions. Common Formats for Surveillance – Hospital are now available for public review and comment. These Formats were developed by AHRQ in collaboration with the interagency Federal Patient Safety Work Group. They are designed to support hospitals that wish to retrospectively study the causes of their 30-day readmissions and thus inform actions aimed at reducing future readmissions. Learn more about AHRQ's Common Formats. The RED is a free toolkit that can reduce readmissions by integrating better communication among clinicians and patients and by instituting follow-up communications after discharge. Developed in a safety-net hospital with AHRQ funding, the RED Toolkit is now used effectively in many hospital settings. Learn more about the RED Toolkit. Project BOOST includes resources to reduce readmissions in the elderly population. The Society for Hospital Medicine offers free quality improvement resources, and individual consultation and technical assistance for a fee. QIOs work under the direction of the Centers for Medicare & Medicaid Services to assist Medicare providers with quality improvement and to review quality concerns for the protection of beneficiaries and the Medicare Trust Fund. Visit the https://www.cms.gov/Medicare/Quality-Initiatives-Patient-Assessment-Instruments/QualityImprovementOrgs/index.html to learn how CMS works with QIOs. programs. The MATCH Toolkit helps hospitals improve medication reconciliation, a critical component of successful hospital discharge. The toolkit includes a workbook to help users with implementation. The AHRQ Innovations Exchange includes a repository of user-submitted experiences on implementing a quality improvement effort around unnecessary readmissions. The exchange includes lessons learned, tools, and user- developed resources. AHRQ’s PSNet offers a searchable compendium of resources and tools on hospital discharge and related topics, such as medication reconciliation. The PSNet also offers a primer that explains how problems with the hospital discharge process can lead to adverse events or complications that result in patients returning unnecessarily to the hospital. The STAAR Initiative, a multi-State effort to improve care transitions, is supported by the Institute for Healthcare Improvement. The STAAR Initiative offers free related resources. 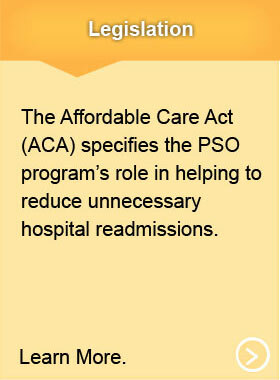 The following section of the Affordable Care Act (ACA) specifies the PSO program's role in helping to reduce unnecessary hospital readmissions. Read the full text of the ACA. SEC. 399KK. QUALITY IMPROVEMENT PROGRAM FOR HOSPITALS WITH A HIGH SEVERITY ADJUSTED READMISSION RATE. In general.-- Not later than 2 years after the date of enactment of this section, the Secretary shall make available a program for eligible hospitals to improve their readmission rates through the use of patient safety organizations (as defined in section 921 (4)). Eligible hospital defined.--In this subsection, the term `eligible hospital' means a hospital that the Secretary determines has a high rate of risk-adjusted readmissions for the conditions described in section 1886(q)(8)(A) of the Social Security Act and has not taken appropriate steps to reduce such readmissions and improve patient safety, as evidenced through historically high rates of readmissions as determined by the Secretary. Risk adjustment.--The Secretary shall utilize appropriate risk-adjustment measures to determine eligible hospitals. Report to the Secretary.--As determined appropriate by the Secretary, eligible hospitals and patient safety organizations working with those hospitals shall report to the Secretary on the processes employed by the hospital to improve readmission rates and the impact of such processes on readmission rates.